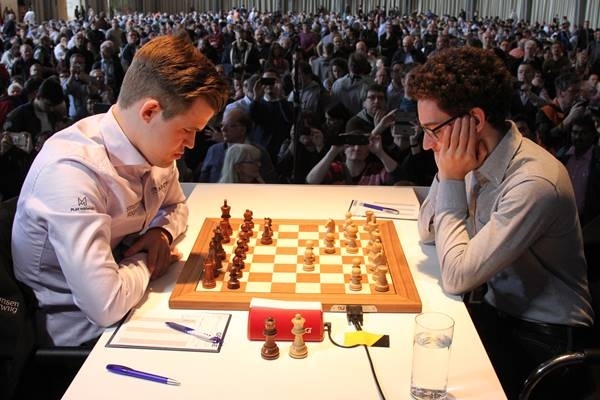 Fabiano Caruana escaped Magnus Carlsen’s clutches in a rook ending that was so complex it reduced the World Champion to an exasperated, “what do I know?” In the end the only decisive game in Saturday’s Round 1 of the GRENKE Chess Classic was Nikita Vitiugov’s win over Matthias Bluebaum after a fantastic tactical shot. 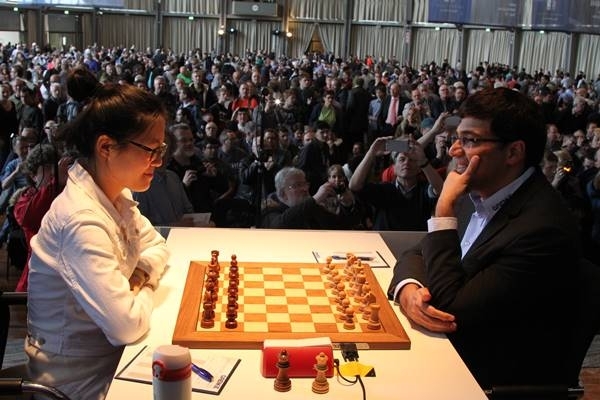 More blood could have been spilt, though, with Arkadij Naiditsch close to beating MVL and Hou Yifan initially on top, then in some danger, against Vishy Anand. 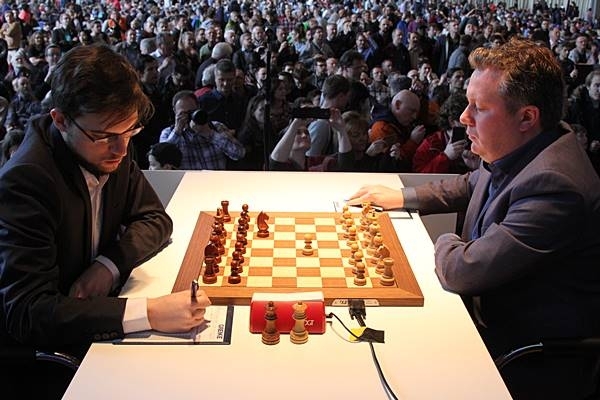 Caruana ½-½ Carlsen: What do I know? It’s the old thing you learn as a child, not to play too quick at critical moments. I think I just had this one lapse where after 38.Rxh7+ if I just go 38…Kg8 I think the game is over. And then after I went 38…Kg6 it wasn’t so easy anymore. I thought he could just resign, but if I’d thought for 2 minutes then I would see that after [39.Rxc7 Rxc7] 40.Kf2 there was still some play, at least. It wasn’t very bright. Caruana: Well maybe literally too! Carlsen: What do I know? That’s why I also tried to play fighting chess because I thought it would be a very good chance to beat him today and I came pretty close, but then… rook endings are difficult! And here, it turns out, there was only one move to win – 54…Rh7, stopping the white kingside pawns. Instead after 54…a5 55.h6! it turned out the white passed pawns were so strong that there was nothing better for Magnus than to force a draw. 15…Nxc5! 16.dxc5 d4 and here White perhaps wisely gave back the material with 17.0-0. 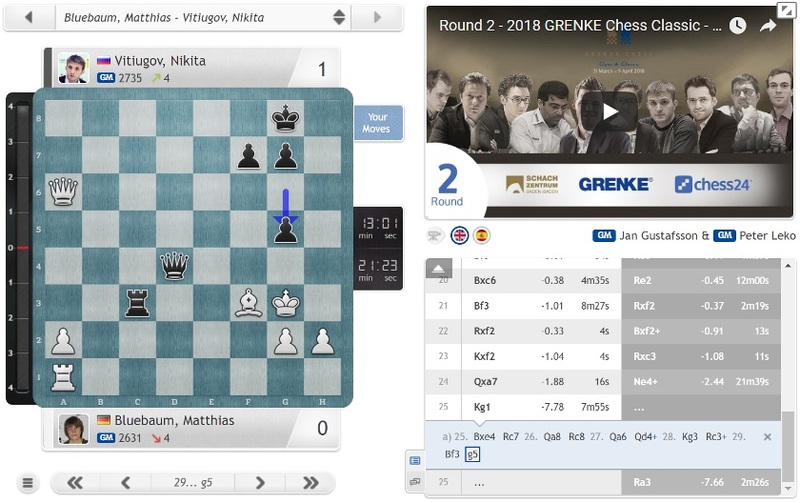 That wasn’t the last or the most dramatic tactical blow, however, since shortly afterwards Nikita unleashed 24…Ne4+!! It was quite a decent game, but I was very lucky, because until the very end it was balanced. Then he just missed this quite nice move 25…Ra3, but instead of 25.Kg1 of course he had to take on e4 and it must be a draw. Practically speaking it was enough in the game to make a draw. Against a computer I wouldn’t have assessed my chances as so great! I haven’t played in a long time so it’s always good to have a decent, sharp game as some kind of accelerated warm-up. Her response was fearless and strong, though, as she decided to “change the type of the position” by going for a pawn sacrifice with 7…d4! 8.exd4 cxd4 9.Nxd4 e5, after which Black seemed to have a clear advantage by move 12. Vishy was equally bold in reply, though, giving up the exchange for a position in which his bishop pair gave White compensation. In fact it was soon White who was on top, with Hou Yifan admitting she was worried until Anand exchanged queens on move 34, after which she had no trouble setting up a blockade. Tune in to live commentary with Jan Gustafsson and Peter Leko here on chess24 from 15:00 CEST!